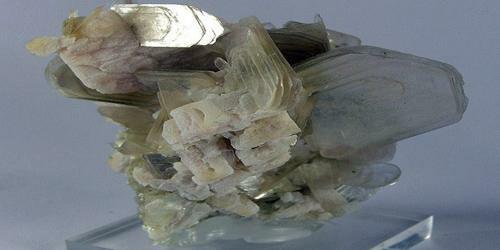 Muscovite is a usually colorless to yellow or pale-gray mica. Muscovite is a monoclinic mineral and is found in igneous rocks, such as granites and pegmatites, metamorphic rocks, such as schists and gneisses, and in many sedimentary rocks. It is a hydrated phyllosilicate mineral of aluminium and potassium with formula KAl2(AlSi3O10)(F,OH)2, or (KF)2(Al2O3)3(SiO2)6(H2O). 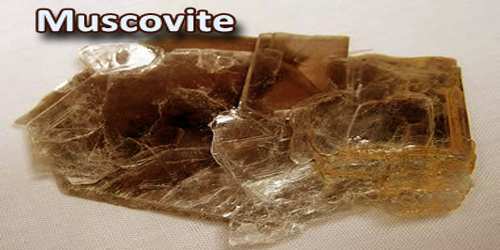 Muscovite can come in enormous crystal groupings that can weigh several hundred pounds. Thin sheets can be peeled off as layers, and the thinner a layer is peeled the greater its transparency becomes. Muscovite sheets have a pearly to vitreous luster on their surface. If they are held up to the light, they are transparent and nearly colorless, but most have a slight brown, yellow, green, or rose-color tint. Its crystals are in thick flakes, micaceous masses and groupings, and in tabular, foliated, flaky, and scaly forms. Crystals may also be elongated with one dimension flat, or stubby triangular or hexagonally shaped crystals. Muscovite also forms interesting aggregates of dense bladed crystals, thick rosettes, uniquely twinned star-shaped formations, and rounded botryoidal and globular masses of dense flakes. Muscovite is a very common rock-forming mineral and is an important constituent in many environments. Its presence is noted especially in granite pegmatites, in contact metamorphic rocks, in metamorphic schists, and in hydrothermal veins. Important Muscovite deposits where large significant crystals occur are almost exclusively from granite pegmatites. It has a highly perfect basal cleavage yielding remarkably thin laminae (sheets) which are often highly elastic. Sheets of muscovite 5 m × 3 m have been found in Nellore, India. The name muscovite comes from Muscovy-glass, a name given to the mineral in Elizabethan England due to its use in medieval Russia as a cheaper alternative to glass in windows. This usage became widely known in England during the sixteenth century with its first mention appearing in letters by George Turberville, the secretary of England’s ambassador to the Russian tsar Ivan the Terrible, in 1568. 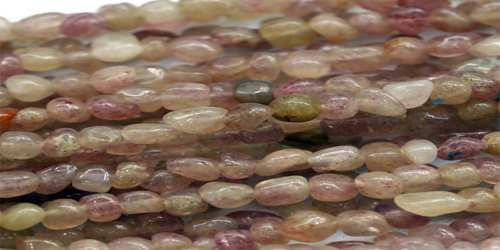 Muscovite is easily identified because its perfect cleavage allows it to be split into thin, flexible, elastic, colorless, transparent sheets with a pearly to vitreous luster. 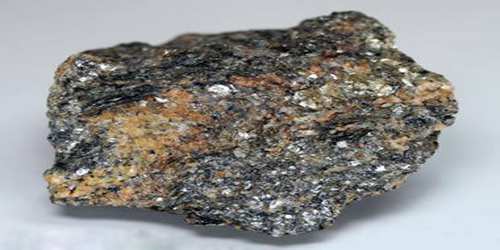 It is the only common mineral with these properties. Muscovite has a very shiny, pearlescent luster, which is why ground muscovite is used to add a glittery look to cosmetics and paints. Sheets of muscovite mica also have very good insulating properties, so it is very commonly used in the construction of both building materials and electronic components. The crystalline structure of muscovite allows it to cleave into thin, uniform sheets that enable it to be used as window panes. However, there are only a few muscovite deposits in Eastern Europe and India that contain large enough crystals to be suitable for windows. Muscovite is the most common type of mica, is used for a variety of purposes, including in paints, cosmetics, construction materials and electronics. Before humans discovered how to make glass from quartz, most glass was made from thin sheets of muscovite, although this glass was not fully transparent.